Laurie Macfarlane introduces 'New Thinking for the British Economy' – openDemocracy's new eBook outlining a new economic agenda for Britain. Western political economy is in a period of upheaval. Neoliberalism – the set of economic ideas and policies that have dominated politics for the past 40 years – is rapidly losing legitimacy in the face of multiple crises: stagnant or falling living standards, sharply rising inequality of income and wealth, financial fragility and environmental breakdown. The Global Financial Crisis of 2007/08 brought an end to the so-called ‘Great Moderation’ – the period of relative economic stability since the 1980s – and laid bare the underlying weaknesses of free market orthodoxy. The impact of the crisis, and the austerity policies that followed, have fractured the political argument in many countries, contributing to a series of political shocks across Britain, the USA and Europe. At the same time, the economics profession has entered a period of intellectual upheaval. Student-­led campaigns for more pluralist economic teaching in universities have gained momentum, while increasing numbers of economists and commentators – including those in mainstream institutions such as the International Monetary Fund (IMF) and the Organisation for Economic Cooperation and Development (OECD) – acknowledge the shortcomings of orthodox economic ideas. Political economic paradigms do not last forever. In the past century, Western political economy has experienced two major shifts from one paradigm to another: firstly from laissez-faire to the post-war consensus after the Great Depression of the 1930s, and secondly from the post-war consensus to neoliberalism in the 1980s. The evident failings of our present economic system, and the growing political mobilisation for change, suggest that we may be on the cusp of another major shift in economic thinking and policy. At this critical juncture, new ideas about the kind of society we want to live in, and the future we want to see, are needed more than ever. 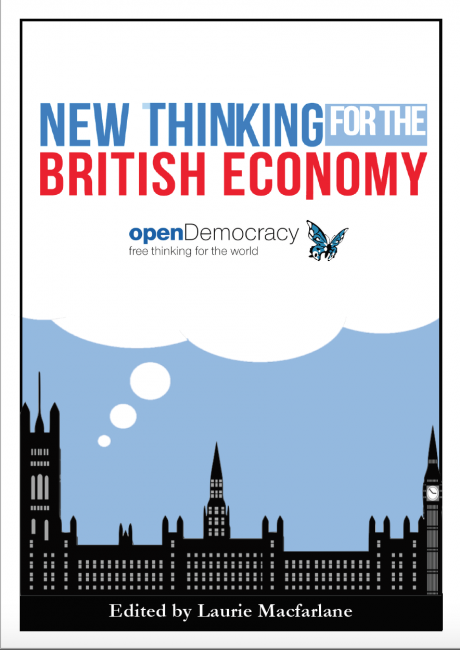 'New Thinking for the British Economy' – a new eBook published today by openDemocracy – brings together leading thinkers to outline the broad pillars of a new post-neoliberal agenda, and the type of policies that are needed to get us there. While there are matters for continued contestation, it is clear that a consensus on the broad outlines of a new political economy are beginning to emerge. This is an economy that embodies in its basic institutional structures the foundational principles of democracy, equality, subsidiarity, resilience and sustainability. This more democratic economy is inclusive and participatory, pays attention to matters of scale and decentralisation, and is plural, allowing for the innovation of new economic forms and approaches at different levels. It involves building new, democratic models of ownership and control of key resources and decision-making across the economy. This new economy is also radically green and sustainable, living safely within ecological limits and boundaries. It is informed by a politics and ideology that leans towards the pragmatic and practical, with a strong non-sectarian solutions-orientation. While debate around ‘the economy’ is often limited to areas of policy that involve monetary exchange, the question of who gets what and why is inherently political, and therefore requires a much deeper of analysis of where power lies in our society. For this reason, the book explores a range of areas that are not typically considered to be within the sphere of economic policy but which nonetheless play a critical role shaping our political economy – such as the media, our care systems, racial inequalities and our constitutional arrangements – as well as more traditional policy areas such as trade, finance, housing and industrial policy. The authors also grapple with strategic questions relating to how to turn these new ideas into reality, such as the ‘critical paths’ needed to create the space for further change; the power dynamics of building new institutions and displacing entrenched vested interests; the tensions and debates that remain on questions of policy; and the intellectual or policy development gaps that need to be filled. This weekend thousands of people will gather in Liverpool for The World Transformed – a 4-day festival of politics, arts and music – to debate and discuss how to create a better world. openDemocracy has teamed up with Commonwealth Publishing and the Democracy Collaborative to produce limited edition hard copies of each chapter, which will be available to purchase for £1. The project to build a new economy is not merely an intellectual endeavour. Rising temperatures, collapsing biodiversity, depleting natural resources and growing resentment towards an economic system that is widely perceived to be unfair all mean that maintaining the status quo is simply not an option. The question is what comes next. We hope this volume serves as an important contribution to this debate.